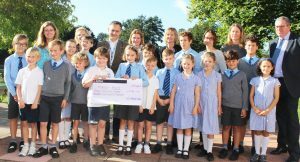 HOE Bridge School in Old Woking has donated nearly £15,000 to two charities. The pupils voted to support Magic Bus and Home For Good during their last academic year and worked tirelessly with their parents and teachers to raise as much as they could. At a special assembly the school presented cheques for nearly £7,500 to each of the charities. In the past four years, the school has raised nearly £80,000 for the charities it has supported and has already begun fundraising for two new charities for this year Bugzi and Salt of The Earth.